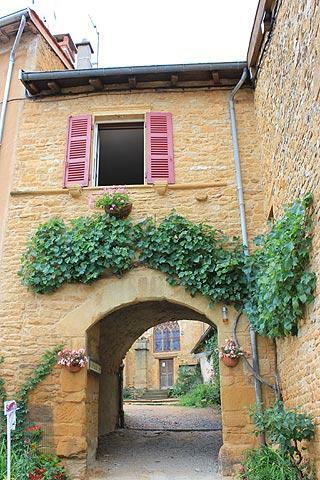 Theizé is a quiet village perched on the side of Mont Bansillon from where it overlooks some of the many vineyards in this important wine-making area. Theize has been populated for many centuries: neolithic people left flints as evidence of their presence, some of the paving stones in the village date to Roman times and Theizé's castle and chapel date to medieval times. 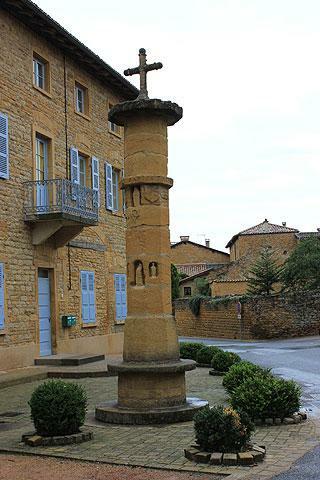 The large stone cross in the village square dates back to 1567 but the little niches underneath the cross were not filled in until 1996. The figures in the niches are the virgin Mary, Saint Claude, Saint Roch and Saint Antoine, the saint of the village. This cross is the Stone Mason's Guild cross. You can also see the gothic style church of Theizé here in the centre of the village, built at the end of the 19th century and without particular interest but quite pretty at sunset. 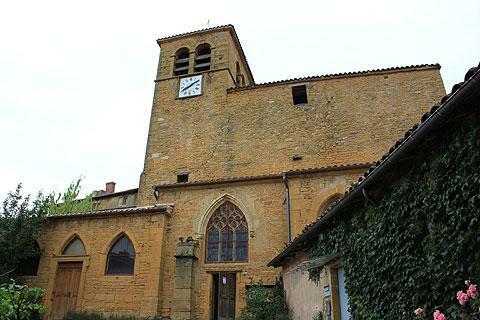 At the top of the village you will see the old church and the Chateau de Rochebonne. The original Chateau de Rochebonne was destroyed during the Hundred Years War in order to stop the castle falling into English hands, and was rebuilt in the 17th century as the chateau we see today. The ancient church, which was once the chapel of the castle of Rochebonne, contains 17th century frescoes. There are also various 'cadoles' - small dry stone shelters - to be seen if you follow the Chemin de la Madone to the north from the Chateau de Rochebonne. Not far to the east of Theizé is the Chapelle of St Hippolyte, a 16th century Chapel. 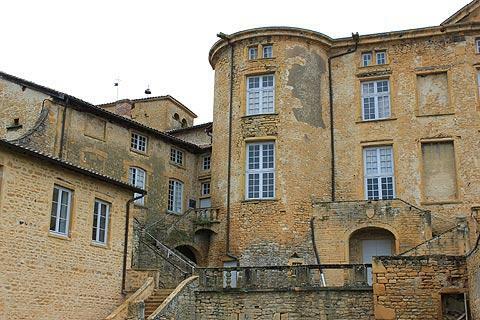 At the entrance to the village you can also see the Chateau de Rapetour, an 18th century castle with an interior courtyard and Renaissance galleries. This charming manor house is only open for visits on Sunday afternoons, from mid-April to mid-October. A good time to visit is Sunday morning when the village is animated by its weekly market. Theize is in the area known as the Beaujolais Region of Golden Stone as the buildings are built using lovely golden stone from a nearby quarry. The countryside arround the village consists of rolling hills many of which are covered by grapevines and dotted by peaceful villages also made of the lovely local stone. Two villages very close to here that you can visit as part of your excursion to Theize are Oingt and Bagnols. 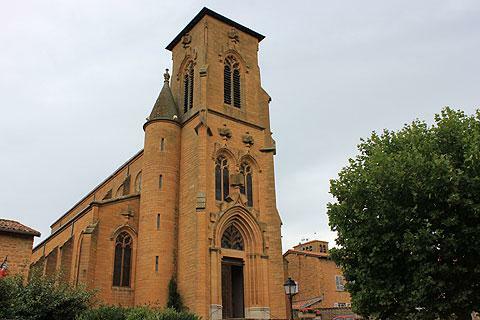 Theizé is in the Beaujolais wine region making wine tasting high on the priority list for most visitors.